A key priority of Canadian Natural’s operational responsibility is a commitment to environmental excellence. 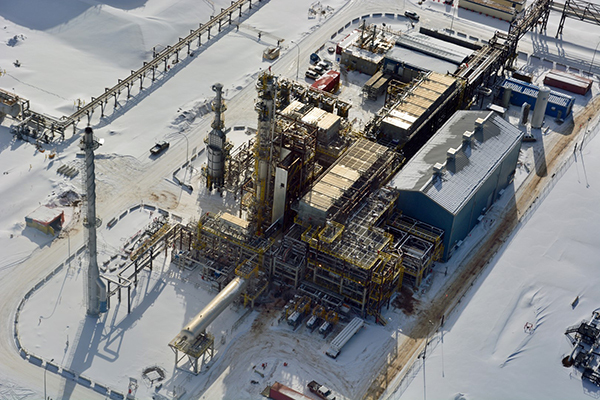 One of the ways we demonstrate this commitment at Horizon is through our partnership with Inter Pipeline Ltd., to capture the off-gas (natural gas liquids and olefins) produced at the upgrader. Construction on the liquids extraction plant at Horizon was completed in the fall of 2015 and it began operating in February 2016. This project helps us reduce greenhouse gas (GHG) and sulphur dioxide (SO2) emissions from our operations. In 2017, we avoided emissions of more than 128,000 tonnes of CO2. We currently target a reduction of approximately 200,000 tonnes of CO2 emissions and 2,000 tonnes of SO2 per year, with Horizon’s production at 250,000 barrels per day. The plant captures and further processes the off-gas, extracting the natural gas liquids (NGLs) including propane, butane and condensate, and the olefins propylene, butylene and olefinic condensate. These NGLs and olefins are transported via pipeline to Inter Pipeline’s Redwater facility. The remaining gas, now cleaner, is sent back to our upgrader to be mixed back in with natural gas, which is then used as fuel. At the end of this process, Canadian Natural has a cleaner burning fuel source and lower overall emissions. The project involved early consultation with the Athabasca Chipewyan First Nation, Fort McKay First Nation and Mikisew Cree First Nation, demonstrating cooperation between industry and community partners who are committed to the reduction of GHG emissions.